Epididymis, Epithelium - Degeneration. Sloughed epididymal epithelium in the duct lumen in a B6C3F1 mouse from a chronic study. 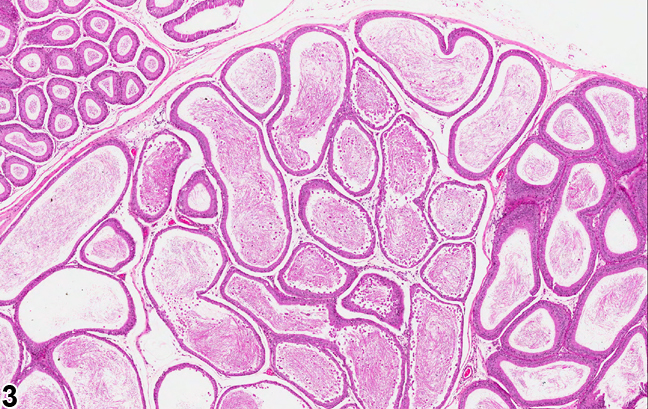 Epididymis, Epithelium - Degeneration. 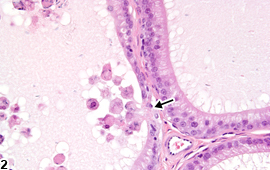 Higher magnification of Figure 1 showing a focal area of cellular degeneration of epithelial sloughing (arrow) in a B6C3F1 mouse from a chronic study. 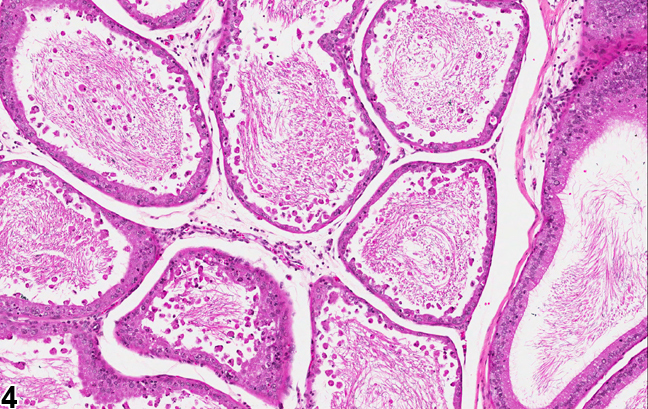 Epididymis, Epithelium - Degeneration. 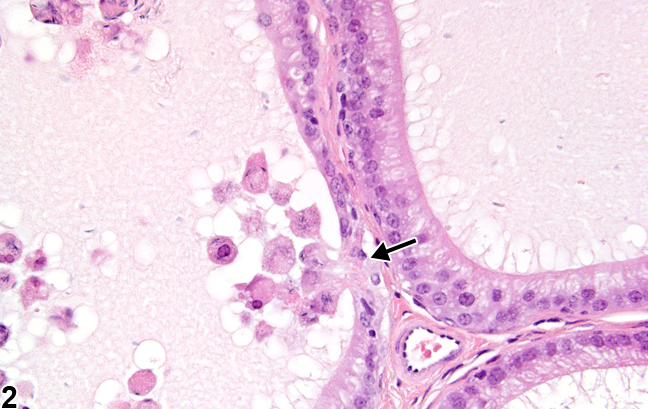 Attenuation and sloughing of epididymal epithelium in the epididymis of a rat. (Photograph courtesy of D. Creasy). 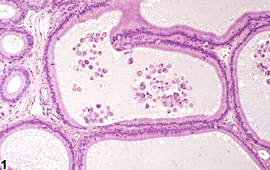 Degeneration and necrosis of the efferent duct or epididymal epithelium are unusual findings, either as a background lesion or as a chemically induced lesion. The lesion is characterized by attenuation and sloughing of the epithelial lining of the epididymal duct. 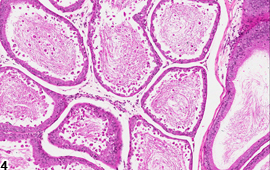 The finding should not be confused with the presence of sloughed testicular germ cells in the epididymal lumen (also see Epididymis, Duct - Exfoliated Germ Cell), where the epididymal epithelium remains normal and intact. If there is a breach of the epithelial lining, it is generally accompanied by an inflammatory infiltrate due to breakdown in the blood-epididymal barrier resulting in exposure of immune cells to the antigenically foreign sperm. 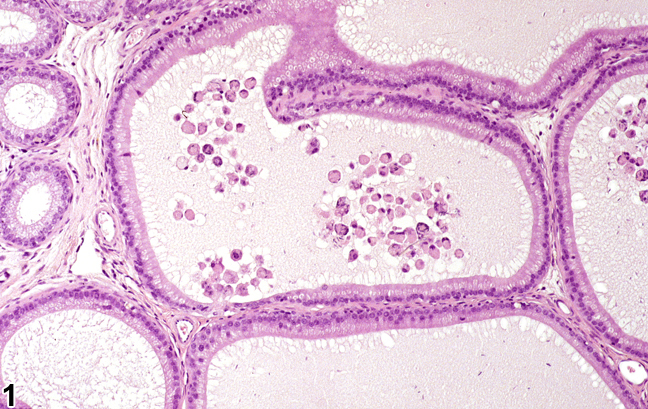 Epithelial degeneration has been described in response to methyl chloride inhalation. Epithelial degeneration should be recorded and graded and should be discussed in the pathology narrative if the incidence and/or severity appears to be related to chemical administration. If both epididymides are involved, the diagnosis should be clarified as bilateral and the severity score based on the more severely affected epididymis. Correlation with any spermatogenic disturbances should be noted in the pathology narrative to aid interpretation. 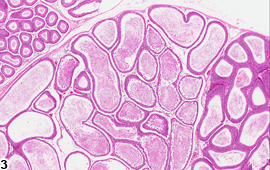 Cytoplasmic vacuolation, although a form of degeneration, should be recorded separately (also see Epididymis, Epithelium - Vacuolation). Chapin RE, White RD, Morgan KT, Bus JS. 1984. Studies of lesions induced in the testis and epididymis of F-344 rats by inhaled methyl chloride. Toxicol Appl Pharmacol 76:328-343. Chellman GJ, Morgan KT, Bus JS, Working PK. 1986. Inhibition of methyl chloride toxicity in male F-344 rats by the anti-inflammatory agent BW-755C. Toxicol Appl Pharmacol 85:365-379.